For our days are ending and our years are failing. 'And now Legolas fell silent, while the others talked, and he looked out against the sun, and as he gazed he saw white sea-birds beating up the River. "Look!" he cried. "Gulls! They are flying far inland. A wonder they are to me and a trouble to my heart. Never in all my life had I met them, until we came to Pelargir, and there I heard them crying in the air as we rode to the battle of the ships. Then I stood still, forgetting war in Middle-earth; for their wailing voices spoke to me of the Sea. The Sea! Alas! I have not yet beheld it. But deep in the hearts of all my kindred lies the sea-longing, which it is perilous to stir. Alas! for the gulls. No peace shall I have again under beech or under elm." In the green feilds of Lebennin! "Green are those fields in the songs of my people; but they were dark then, grey wastes in the blackness before us. And over the wide land, trampling unheeded the grass and the flowers, we hunted our foes through a day and a night, until we came to the end of the Great River at last." "Then I thought in my heart that we drew near to the Sea; for wide was the water in the darkness, and the sea-birds innumerable cried on its shores. Alas for the wailing of the gulls! Did not the Lady tell me to beware of them? And now I cannot forget them." What drove you to leave? There is a ton of information and speculation out there on Legolas so I'll try not to repeat the obvious like he's a silvan elf from mirkwood. Though Tolien never specifies his age, in the movie Jackson puts him at 2931, though it doesn't really matter since he's immortal...no one knows the date of his death either because he passes beyond the sea and isn't heard from again. He was tall, fair..(in this case we are assuming this means extremely handsome, and not that he necessarily had blonde hair. Though his skin might have been lightish...) and had bright eyes ( meaning alive full of curiosity..again tolkien can not always be taken in the literal sense). As an elf he is probably (stress this word) slim and able to move very quietly and quickly. Legolas wore the colors of his race, brown and green, which as they lived in a forest would make very good camoflauge colors. This makes it seem the elves are a very private people who don't necessarily welcome outsiders. They are quiet and let others carry on with their rashness and tempers, while the elves remain coolheaded and objective. On the journey Legolas is the only one who seems not to be tempted to use the ring at all. One could argue that this is because the ring wasn't one of the ones made for the elves, but then you see how galadriel is tempted. He seems to be having fun on the journey, especially when he is able to walk ahead of the others on top of the snow, while they slowly trudge through it. Legolas is sensitive and caring, but is a warrior at heart, and is able to do what needs to be done. Some might see his silent ways as cold, stuck up, or uncaring, but if you look closely you can see Legolas is always watching, observing. If he has something to contribute, he says it and no more. He gates his point across very easily. Its a lament to Gandalf. I do not have the heart to tell you. The grief is still too near. ..apparently Legolas is supposed to be the one who accomplished the least among the Fellowship. I beg to differ, how many times did he save the companions lives at the risk of his own. he has an amazing talent for pushing or shoving or pulling people out of the way just in time. I think the one who accomplished the least would probably be Boromir or Gimli. Though EVERY single one of the Fellowship was vital to the destroying of the ring, and no one can say any of the companions wasn't important. Aragorn was supposed to be the top dog in the movie...and he did a great job, I just wonder how he felt about getting upstaged by a young elf? "Tolkien stresses 2 times that Legolas, though his name is a dialectal form of the Woodland Elves, is a Woodland Elf, yes, but also Sindarin in origin like his father, just like Galadriel is queen of the Elves of Lothlórien, but she herself is a Noldor Elf. This is an assumption, but I think Thranduil was a Sindar Elf who became ruler of the Silvan (originally Nandorin Elves). His son was born while he was already in Mirkwood and thus received a name of the Woodland Elves. " While I believe this could be very true..there is also the fact that no one knows of what race of elf Legolas' mother was...and his name could come from her race. Since it is stressed that he is a "woodland elf" i believe that is likely that his mother is from that race, because just being born there probably wouldn't be enough for him to belong to that race, if his father was another. Was he blond or brown? "Frodo looked up at the Elf standing tall above him, as he gazed into night, seeking a mark to shoot at. His head was dark, crowned with sharp white stars that glittered in the black pools of the sky behind." Source: J.R.R. Tolkien - The Lord of the Rings: The Fellowship of the Ring "
When I first saw Orlando Bloom dressed as Legolas, I said to myself right then and there, "That is the DEFINITIVE Legolas." A lot of people complained about the blond hair. Why is he blond? Almost overnight, the Great Hair Color Debate raged across the Internet. What color should Legolas' hair be? The book doesn't say and, quite frankly, I never really cared that much, although I always pictured him as being dark-haired myself. Why? No idea. 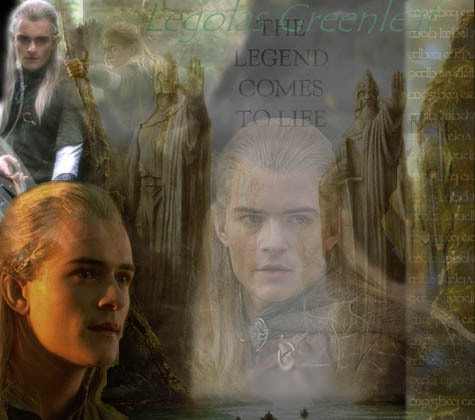 That's just the way I saw him...until Orlando Bloom (who is himself dark-haired) stepped into the pointy shoes of nearly every Tolkien fan's favorite Elf (in the movies)......Legolas is an enigma. A lot of people have devoted a great deal of time to trying to figure him out. The color of his hair isn't the only question people have asked about him. How old is he? Is he married? Does he have any brothers or sisters? Was he at the Battle of Five Armies? The answers to all these questions are: Don't know. What do you think? and Whatever you want the answer to be. When I wrote my review of the movie last month, I heard from a couple of flamers, as I expected, over the tobacco comment I included. But if they were hoping for a long, drawn-out exchange, they were sadly disappointed. I think I responded to one, and had to let his last message go without further reply. You see, I was too busy reassuring anxious young maidens that their beloved Elf warrior would indeed return in the next two installments of the Orlando Bloom Saga. What, exactly, is it about Legolas which sparked such intense interest? I've thought about starting a poll, but I'm not sure the server has been built which could handle the traffic. Xenite.Org's traffic tripled in December. I have no idea of where the bandwidth will stop flowing for January, but my Web-hosting ISP has already informed me that I won't be renewing on my current contract when it runs out in February. Do people recognize him on the street? Apparently not. In a recent interview, Mr. Bloom said that, without his blond wig, he's apparently just another young guy walking down the street. People don't notice him. Well, I don't think that will last long. Orlando Bloom will probably be the Tom Cruise of the early 21st century. And speaking of Legolas...oh, yes. Orlando plays a character named Legolas in these movies Peter Jackson put together for him. How much like Tolkien's Legolas is Peter Jackson's Legolas? I've been asked that, actually. I noted in my review how spectacular Sir Ian McKellen is as Gandalf. I think he's absolutely fantastic as Gandalf. Well, I can honestly say the same thing about Orlando Bloom. He's absolutely fantastic as Legolas. I think he comes as close to portraying a Tolkien Legolas as any actor alive today would be capable of doing. Are there differences between the film character and the book? Yes. Legolas in the movie is not quite as reserved as Legolas in the book. The Legolas in the book is a bit playful and mischievous. The whole quest thing is almost like a holiday for him. The movie Legolas is so darned serious. I can see why all the girls like him. They want to soothe his brow, massage his shoulders, help him relax. And yet, he moves with the grace of a cat. And that walk is something Orlando says he practiced. He put a lot of time and thought into figuring out what Legolas' movement should be like. It was time well-spent. But let's not forget that Legolas is strong, loyal, dedicated, and he kills Orcs really, really fast. Legolas is a very violent character in the movie. He's deadly, cold, and calculating when he confronts Orcs. But he also has some interesting reactions. One of the odder parts of the movie occurs in the council of Elrond, when all the Elves and Dwarves start yelling at each other. There is nothing like this in the book. No Tolkien Elf or Dwarf would behave that way. Not under such circumstances. But when that little guy steps forward and offers to accompany Legolas on his heroic journey (or was it the other way around? ), Gimli offers his axe. And just a that moment, you see the Look on Legolas' face. He realizes that this really isn't HIS movie. He actually seems to panic for the briefest moment. Well, people thought it was a funny look, and obviously all the shouting was intended to give Orlando an opportunity to ham it up in his movie. I think he did a good job. That scene, by the way, is the one I referred to when I said that Legolas gave Gimli a priceless look. I've been asked about that comment quite a bit. I wish I did know how old Legolas was supposed to be. For the movie, they decided he was 2931 years old. Where did they come up with that age? No idea. It has no relevance to any published Tolkien text of which I am aware. But, I doubt anyone will care much. Now, if you'll excuse me, I have to answer some email. Michael Martinez is the author of Visualizing Middle-earth, which may be purchased directly from Xlibris Corp.
Attolma i menelessie, nai airitainiéva esselya. Nai ardalya tuluva. Nai írelya tyarniéva mardesse ve menelesse. Anta men síre ilyaurea mastalma. Ar avanta men raikalmar ve avantalme raikatyarolmain. Ar nai útukuvalye me mailenna. ná fainu me ulkallo. Amen. Read "Now We All Have Elvish Names"
Elfling - the best mailing list devoted to Tolkien's languages! The Tengwar - download Daniel S. Smith's fonts for Tolkien's most beautiful Elvish script! This site is dedicated to the study of Tolkien's languages, in particular Quenya and Sindarin, and the writing systems known as tengwar and cirth. This is the homepage for the Tolkien Language List. This list, also know as TolkLang, is an electronic mailing list. THE STRUCTURE OF QUENYA: A BRIEF SURVEY. Single Word Translator. Translation English To Quenya. A Sindarin dictionary project, searchable online and downloadable. by the Elves in JRR Tolkien's Lord of the Rings books. "It was designed by Alan Lee, who illustrated all of the Lord of the Rings books. It's in Elvish script, and it's the word for nine. We all chose to put them in different places. I got mine on my forearm, because I'm an archer." He's not bothered by raging snowstorms. He can run on snow. He can tell a sparrow from a finch a league off. He can fight with knives. He readies an arrow on a bow faster than the eye can follow. He's got a killer aim. He has a way with good animals. He's not afraid of the Dead of Men. you can and skip to the page with character info, elvish script ect..